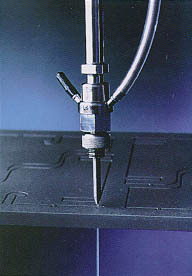 JET-CUT INC. became the first and only waterjet cutting job shop in Waterloo Region when it opened its doors in April, 1994. 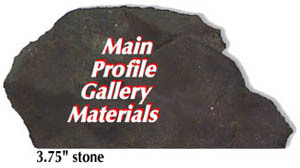 We currently operate out of a modern, 2000 sq.ft. shop in the heart of Canada's Technology Triangle, Waterloo, Ontario. 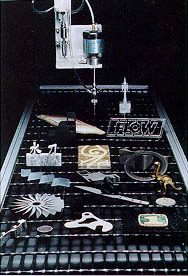 Jet-Cut services its clientele with a single machine designed by Flow Automation, formerly Dynovation. It has a 48" x 96" table, a 6" Z-axis, a waterflow capability of Mach III, with a range of 15,000 - 40,000 psi. This unit machines without creating heat-affected zones, thereby eliminating the distortion that always accompanies other machining methods. This cold-water jet incorporates a stream of fine abrasive particles (typically 80-mesh garnet, occasionally 50- or 120-mesh garnet) that allows us to cut hard materials over a thickness range that can run from 0.01" to 4", with a kerf width of .03" - .05". Jet-Cut Inc. services clients in the automotive, aerospace, signage, packaging, automation and pharmaceutical industries, in addition to government and other civic organizations. Our primary region of operation is Southwestern Ontario, including Wellington, Halton, Hamilton Wentworth, Niagara, Brant, Waterloo, Perth, Oxford and Elgin Counties. However, we are always looking for new challenges in different markets, for different industries, and we would invite you to email us with any project of any size.